On Monday, 6 August, the Deputy Prime Minister, Nick Clegg, announced that because the Prime Minister could not deliver Conservative party backbench support for the coalition’s House of Lords Reform Bill, it was being withdrawn. Mr Clegg interpreted this as the Conservative party failing to deliver on part of its coalition agreement – a point also made by other Liberal Democrat spokespersons (rather unsuccessfully in some cases, as with Jeremy Browne on the next day’s Today programme). As a consequence he would instruct his party to vote against the main Conservative component in the package of constitutional changes in that agreement – the Boundary Commissions’ recommendations for 600 new Parliamentary constituencies involving a reduction in the number of MPs, much greater electoral equality and more frequent (every five years) redistributions. The Boundary Commissions are currently just over half-way through their review implementing the new rules for redistribution. They have published their initial proposals and undertaken the first stage of the public consultation process. Revised recommendations are expected in October, and after a further period of consultation they are expected to complete their work in mid-2013. Their final recommendations have to be delivered by October 2013 and presented to both Houses for approval. When they are tabled in the House of Commons, Mr Clegg (who was responsible for the Act which created the new situation, though it was steered through by a Conservative Minister, Mark Harper) would have been expected to present the Orders. There is, of course, a precedent for a Cabinet Minister presenting such an Order, only for his whips to ensure it was defeated – James Callaghan in 1969 – although that did not have the potential to bring down a government. Mr Clegg may well pass the task to another, but if he does instruct his MPs, including all Liberal Democrat Ministers, to vote against and assist Labour in defeating the Orders this could lead to the coalition’s demise! The House of Commons passes a motion ‘That this House has no confidence in her Majesty’s Government’ and a further motion ‘That this House has confidence in her Majesty’s Government’ is not then passed (presumably on another potential government, with a different leader, than that in which no confidence was recently expressed) within fifteen days of the first motion. If the government falls as a consequence of the vote on the new 600 constituencies, therefore, an immediate general election may follow if the House of Commons so decides. It would be fought in the existing 650 seats. Of course, if Labour and the Liberal Democrat MPs all voted against the Order, it would not necessarily fail. Together they could muster 312 votes (assuming a Labour win in the forthcoming Corby by-election) to the Conservatives 304. Everything would then depend on the 25 other MPs who normally attend and vote (i.e. excluding Sinn Féin’s five plus the Speaker and three Deputies): nine Scottish and Welsh nationalists, eight from the DUP, three from the SDLP, three from single-member parties (Alliance, Green, Respect) and the two independents. It would be possible, but difficult, for the Conservatives to use ‘sweeteners’ to manufacture a majority of 321 without their coalition partners, if they were determined to get the new constituencies in place for the 2015 election. And David Cameron has indicated that they will be determined. The legislation was introduced because the Conservatives believe – rightly – that they have been substantially disadvantaged by the operation of the electoral system for two decades. They also believe – wrongly – that the major reason for this is the current inequality in constituency electorates, which substantially favours Labour. That component of the pro-Labour bias is much less than they sometimes claim. Nevertheless, analysis of the Boundary Commissions’ initial recommendations clearly indicates should be the Conservatives will be the major beneficiaries of the first implementation of the new system for redistributions and the reduced number of MPs. In 2010, they gained a lead over Labour of 48 seats. If that election had been fought in the Commissions’ proposed new seats, best estimates suggest that their lead over Labour would have been extended to 68 seats (in a House of only 600 MPs compared to the current 650). With the Liberal Democrats estimated to win only 46 seats (they got 57 in 2010), the Conservatives would have been only two seats short of an overall majority (and with Sinn Féin MPs not voting would in effect have a very small one). At this stage, however unlikely it might be that Mr Clegg carries out his threat (assuming he is still leading his party in a year’s time), it is illuminating to rehearse briefly several other scenarios that might play out. The first – although very unlikely, because of the loss of face it would involve and the potential use of Parliamentary time – is that the 2011 Act is repealed in autumn 2012. The Boundary Commissions will then terminate the present exercise and the previous legislation will come back into play. This requires them to undertake a review every 8-12 years. The last one was completed in 2007 (2004 in Scotland) and in order to meet that timetable they (especially the English Commission) may deem it necessary to start a review in 2013. It would not report until after the 2015 general election, however, which would have to be fought in the current 650 constituencies with some at least of the pro-Labour biases accentuated in seats that were created using 2000-2001 electoral data. New constituencies would only be in place in time for the 2020 election – but with at least the same number of MPs as now, and perhaps a few more. One of a second pair of scenarios would eventuate if the Boundary Commissions complete their current task in 2013, but their recommendations are then voted down by Parliament. In that case too, the 2015 election would be held in the current 650 constituencies. Much will then depend on who wins that election. If the Conservatives do, or they are the largest party in a new coalition government, they will presumably retain the current legislation (perhaps with some amendments: they were pressured to retain Public Hearings and may try again to abolish them – like the previous Local Inquiries, they continue to be dominated by the political parties). The Boundary Commissions will, under the 2011 Act, start their next review in 2015-2016, to produce a House of 600 members by October 2018, for use at the 2020 election. The 600 constituencies currently being created would probably form the basis for that exercise, although significant changes in some areas may be needed because of population movements, re-warding by local government boundary commissions, and the impact of Individual Electoral Registration, assuming that legislation passes. If Labour forms a government in 2015, however, or is the largest party in a coalition, it may well repeal the 2011 legislation, which it vigorously opposed, especially in the long and tedious House of Lords Second Reading debates. The Boundary Commissions would then have to begin a new review based on the rules set out in the Boundary Commissions Act, 1986 (before it was amended by the Parliamentary Voting System and Constituencies Act, 2011). Under those conditions, it is unlikely that that review would be completed in time for new constituencies to be in place for the 2020 general election (particularly in England: it may be completed and its recommendations implemented in the other three countries). In that case an election would be held 2020 in the 650 constituencies based on data some twenty years old, with very substantial electoral inequality (although, given the growing re-population of urban England recently reported, this may not be as much to Labour’s advantage – except in Scotland and Wales – as it has been previously). The new constituencies, based on 2015 electoral data, would then be ten years old when first used in 2025 – exactly the situation the Conservatives sought to avoid with the 2011 legislation. Half-way through the two decades from 2000, there are already substantial variations in constituency electorates within each country. In December 2011, for example, the average English constituency contained 72,522 voters but three (including the two Wirral seats) had electorates below 60,000 and a further 47 had 60,000-65,000: at the other end of the scale, three (Manchester Central, East Ham and the Isle of Wight) had electorates in excess of 90,000, and another 45 had 85,000-90,000. By 2020, the variation would be much greater. Meanwhile, in over-represented Wales the current average electorate is just 57,465, and four of the 40 constituencies have fewer than 50,000 voters. Finally, if the Commissions’ recommendations for 600 new constituencies are accepted by Parliament in 2013 and used for the 2015 general election, what happens next remains a matter of conjecture. If Labour wins then it will probably seek to amend the Act, creating new rules (probably with a wider range of acceptable electorate sizes that the 5 per cent maximum variation from the average currently enacted and different guidelines for the conduct of public consultation, and perhaps also with less frequent redistributions than every five years)? If so, the outcome could well be another new set of constituencies considerably different from those used for the 2015 election. If the Conservatives win, they are more likely to retain the current rules – though some at least of their MPs are uneasy about them. At one stage before the 2010 election there was talk of reducing the size of the House of Commons in two tranches – to 585 MPs in 2015 and then 500 in 2020 (a goal supported by some Liberal Democrat MPs). After the problems with the current redistribution that is probably now off their agenda! If a week is a long time in politics, a year is a geological era and much may happen to change Mr Clegg’s stance – if not that of his Conservative partners – before the Orders based on the Boundary Commissions’ current reviews are placed before Parliament and voted on. But if, for some reason, those new constituencies are not in place in time for the 2015 general election, the result will not only be a larger House of Commons than that legislated for in the coalition government’s early months, but also a very unsatisfactory, ancient, set of unequal constituencies (both across and within each of the UK’s four countries) and all the biases this can introduce to the electoral system’s operation. 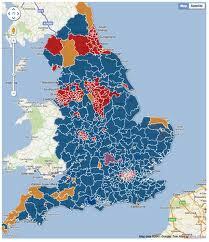 As seemed possible at times in 2010, Labour could win a majority even though it wasn’t the largest party! This entry was posted in Elections and referendums, Parliament and tagged boundary changes, Coalition, House of Commons, Nick Clegg. Bookmark the permalink.